Address: Hungria, 6, Puerto del Carmen (Lanzarote), Islas Canarias. Featuring 4 outdoor pools and charming white bungalows with terraces, Hyde Park Lane is a 10-minute walk from Los Pocillos Beach. This complex is set in 30,000 m² of gardens. Free WiFi is offered throughout the property and free public parking is available nearby. Each bungalow has a kitchenette equipped with a fridge, microwave and ceramic hob and a balcony or terrace with barbecue and views of the pool or the garden. There is also a living room with satellite TV. Free WiFi is available. Guests can enjoy a buffet breakfast and dinner in the Hyde Park’s restaurant, while the poolside snack bar serves cocktails in the evenings. There is also a supermarket within the complex. The Park Lane has a tennis court, 4 paddle tennis courts. A mini disco and entertainment for adults are available all year round. Bicycle and car rental can also be organised. There is a spa equipped with sauna, hot tub and ice baths, and a wide selection of massages are available. A small fitness centre is featured. 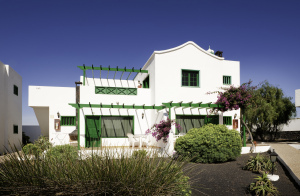 The Hyde Park Lane is set 2 km from the centre of Puerto del Carmen. Lanzarote Airport is just 10 minutes’ drive away. Please inform Hyde Park Lane in advance of your expected arrival time. You can use the Special Requests box when booking, or contact the property directly with the contact details provided in your confirmation. Bungalows are cleaned 5 times a week, with towels changed twice weekly and bed linen once. Room heaters are available in winter months. Adults and children's entertainment only runs in July and August.